There are three new cellar experiences to enjoy in the Hunter Valley, travel editor Winsor Dobbin reports. The Barossa Valley has the iconic Seppeltsfield complex, McLaren Vale has the futuristic d’Arenberg Cube and now the Hunter Valley has its own spectacular new wine tourism drawcard. The $8 million Brokenwood cellar door and restaurant complex officially opened late last year in the centre of Pokolbin. Brokenwood was founded in 1970 by legal eagles James Halliday, John Beeston and Tony Albert and has been one of Australia’s premium wine producers for close to five decades. Co-founder Halliday, now a leading wine writer, was to have overseen the official opening, but was unwell. Managing director and chief winemaker Iain Riggs AM said the new building would increase potential visitation to Brokenwood from 70,000 annually at present to well over double that figure. 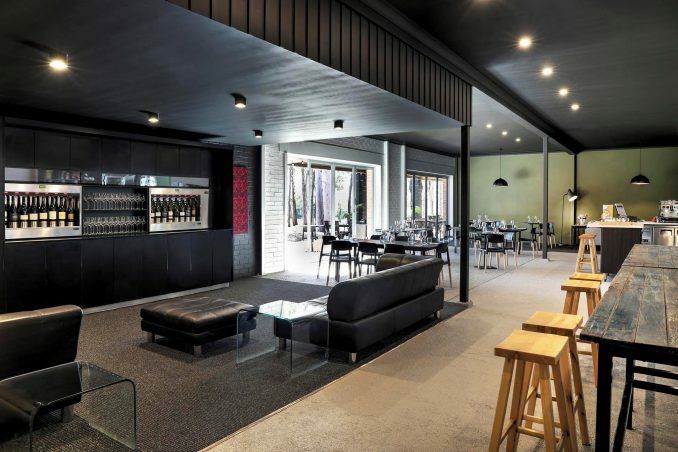 Designed by Sydney-based architects Villa + Villa, the cellar door is one of the largest in the Hunter wine region, covering 1,400 square metres. The new complex, with a striking exterior featuring Australian timbers, includes a tasting room that features circular tasting ‘pods’, an outdoor terrace, two private tasting rooms, two private dining rooms, a wine museum and a lounge area. The two on-site dining venues are run by Andy and Janet Wright, previously of The Cellar Restaurant at Hunter Valley Gardens. The casual Cru Bar + Pantry will feature light meals, pizzas, deli offerings and house-made pies, while the modern up-market dining room, The Wood Restaurant, will be open seven days a week during the day and for dinner on Friday and Saturday nights. There will be a strong focus on seafood with fresh oysters daily and dishes like Stormy Bay clams with nduja, caper and anchovy butter cooked en papillote. The 90-seat restaurant will feature a large display of fresh seafood from the Sydney Fish Market. Premium Brokenwood wines, including the Graveyard Vineyard Shiraz and ILR Semillon, will be available at both venues, including an Enomatic self-service dispenser that will serve rare wines not ordinarily available for tasting at the cellar door. Wines on offer will include not only those from the Hunter Valley but also from Brokenwood’s vineyards in Orange, McLaren Vale, Beechworth and the Canberra region. The museum is devoted to Brokenwood’s history, while tourism offerings will include shiraz and semillon masterclasses, a blending exercise, and winery tours. Cellar door tastings will start from $10 with single-vineyard tastings at $25. For full details see www.brokenwood.com.au. Just across the road, in what used to be the Small Winemakers’ Centre, is Wine House Hunter Valley. There has been a re-branding, re-furbishing and re-naming, as well as the arrival of an all-day lounge with all-day share plate menus to match the wines of producers including The Little Wine Company, Silkman Wines, Thomas Wines, David Hook and Hart and Hunter. Several of the wineries involved have their own cellar doors, but the Wine House is designed for visitors who want to taste several different styles in the one spot. The change comes after 30 years, with well-known local chef Ros Baldwin joining the team. The menu in the former Epicure Cafe space features share plates of dishes like slow-cooked lamb shoulder with pomegranate seeds, coriander, barley and hummus and goat cheese croquettes with braised pepperonata and herbed crème fraiche. There is also a range of deli platters and a selection of desserts. The tasting bar and wine lounge offer an ever-changing selection of more than 40 wines by the taste or by the glass, from the Hunter Valley and beyond. A series of structured wine experiences with various themes will be presented with culinary pairings with Enomatic machines allowing visitors to compare Australian varieties alongside international wines for a global wine experience. Suzanne Little, winemaker of the Little Wine Company and Director of Wine House Hunter Valley says: “Whether people are here to simply enjoy wine and time with good friends or they are on a quest to further their wine knowledge, we believe that their tasting experience is as important as the wine itself. “Keeping this in mind we have designed the Wine House to ensure it is welcoming, informative and relaxing. We are excited to be building on what this boutique collective has been offering for the past 30 years. An ideal one-stop shop for anyone lacking enough time to explore further. A third recent arrival is Comyns and Co., the tasting facility of winemaker Scott Comyns and his wife Missy, the cellar door manager. Comyns has been chief winemaker at Tempus Two, Pepper Tree and Briar Ridge, and more recently has been assisting Andrew Thomas at Thomas Wines. Located in the Peppers Creek Village complex – along with Cafe Enzo, Pukara Estate Olives and David Hook Wines – the new tasting facility is in the heart of wine country and has a wonderful view. One of the hallmarks of the Comyns and Co. wines has been the striking labelling on the bottles – designed by Scott’s brother Angus, who is an artist.